When we moved to our house almost 2 years ago, we set up the extra bedroom as an office space. At the time I was working, had an 18 month old and was very pregnant. So I pretty much just filled the room with all the stuff that didn't have a place and closed the door. Opening it only to shove more stuff in. This summer when I made the decision to stay home, I realized that one of the main factors in making that work would be having a place to work, not just for the kids but also for me. So I turned my sites on the overflowing "office." After several months, many, many trips to Ikea and countless pins on pinterest we finally have a family studio space that I love! The room has three main purposes: 1) storage for art and office supplies, 2) a place for files and papers and 3) a space to work for both kids and adults. I had to get a little creative to for storage, we have a lot of art and office stuff and the room is not that big. I also wanted to make sure that everything was easily accesable, so that it would be an enticing space. I started by putting all our art supplies in small, clear plastic bins and labeling them. I put two bookshelves in the room and put the kid friendly supplies on the lower shelves and non-kid friendly supplies higher up. I also put things like beads, buttons, and spools of thread into clear plastic and glass jars. I love the color they add! 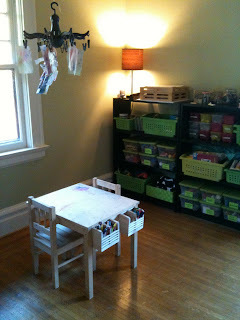 For my tools and supplies that I didn't want in the reach of the girls, I hung from an inexpensive system from Ikea. 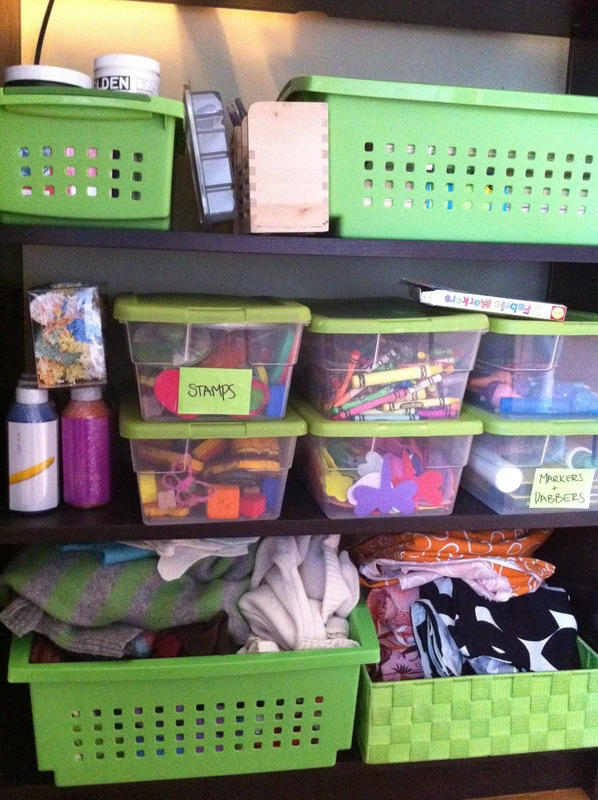 A variety of storage bins hold sciscors, sharpies, sewing tools, ribbon, tape and other supplies. 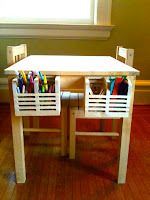 Even the girls work table has storage for their art supplies and a place to hang their art work. You can read more about their works space here. Along one wall of the room is a large, long series of tables and shelves from Ikea. The pieces all fit together to create a large work space with the added benefit of built in storage. On the far left there are two file drawers and some more shelves for storage bins. On the table space above is room for storing current papers and paying bills. 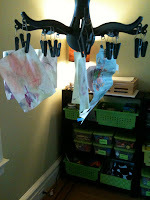 While we use our kitchen table for a lot of our art work, I wanted to have a designated space for in process projects. For me, I really wanted a place for my sewing machine! While I know the sewing basics, it is something I would like to get better at, but lugging my sewing machine out of storage always seemed like such a chore. 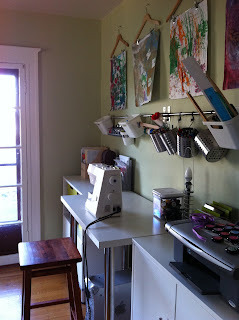 Since having the sewing machine out in a designated space I have already used it several times! I wanted to make sure that the room had space to display family artwork and saw a great idea for hanging art with wooden hangers on Babble. I thought it was perfect. We already had the hangers so I hung them with nails and choose some of the girls larger paintings. Also on the walls we have our magnet/chalk board that the girls can play with and our felt ball garland. So here is the thing, you don't have to have a designated studio space to make art, by yourself or with kids. We spent the last few years making great art on our kitchen table. However, having a space dedicated for making stuff has it's perks, some I expected, some I never would have thought of. 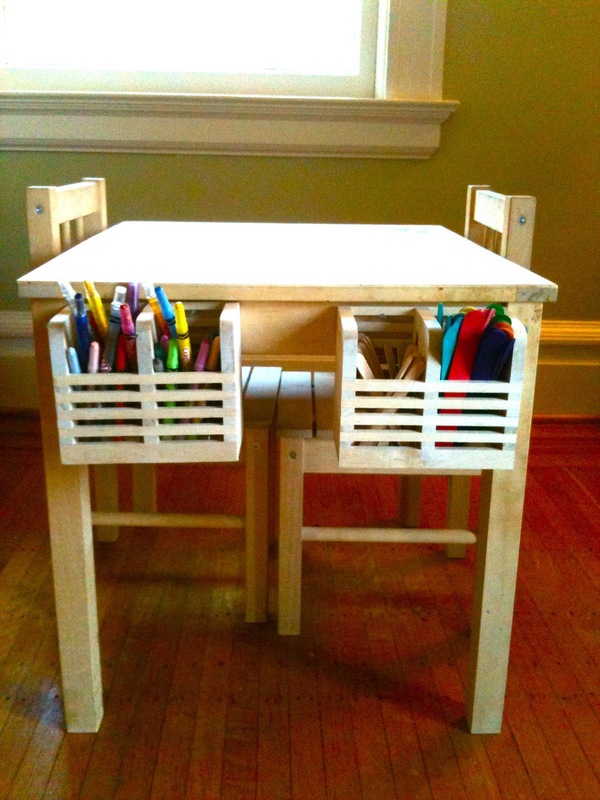 1) Having an organized space and materials makes doing any project, especially spontaneous projects a lot easier. I am much more likely to do a project on my own or with the girls if I don't have to go digging around for the materials. 2) A dedicated space means that you can work on projects longer. One of the down sides to always working on the kitchen table is that you can only work until the next meal. The studio allows us to set aside projects and come back to them when we have the time. 3) Some times the best inspiration is a material or object. Having all the art materials out and visible means that sometimes we walk into the room board and get inspired to color by seeing the crayons. 4) Having one space for the whole family means that I get to do some of my own work too, well in theory. But it does mean that the girls and I can all be in the same room each working on something that interests us individually.